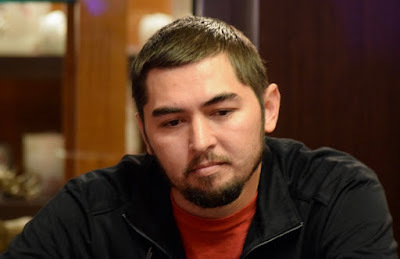 Ryan Lum is the short stack with 20 players remaining. He moves in and is called by Hong Zhang to put Lum at risk. Zhang has pocket Sevens and is up against Lum's Eight_Nine of Hearts. The 8-6-7 flop gives Zhang a set and Lum hits both top pair plus an open-ended straight draw. The turn 5 moves Lum ahead with the straight. The river pairs the board, however, and Zhang goes boat. Lum finishes 20th, cashing for $1,815 and the field is one elimination away from the two-table redraw.